The man accused of killing two siblings in a driving under the influence crash is trying to get his bond reduced because his family can’t afford it. 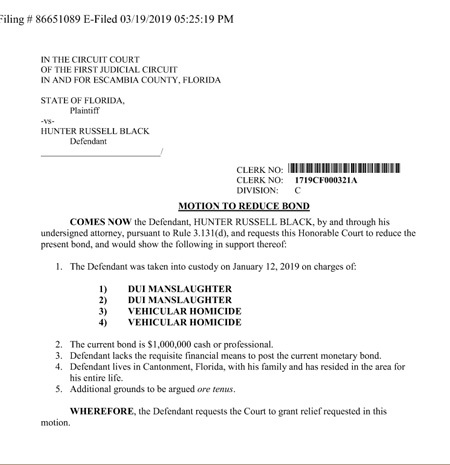 Hunter Black is accused of killing 15-year-old Sean Banks and 22-year-old Antoinette McCoy in January in an early morning crash on Kingsfield Road. Black is currently facing two of vehicular manslaughter and two counts of DUI manslaughter. 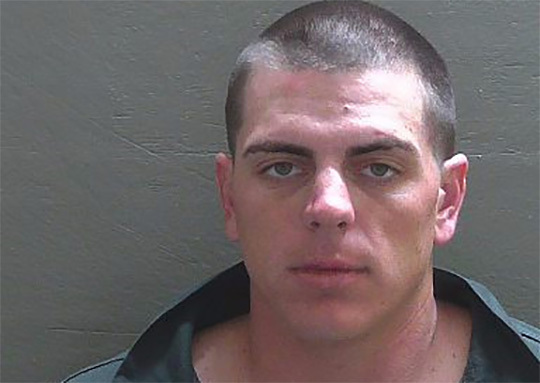 He’s being held in the Escambia County Jail with bond set at $1 million. A Florida Department of Law Enforcement report showed there was no alcohol found in Black’s system, but it was positive for Xanax and chemicals that can be linked to THC, the psychoactive ingredient in marijuana. In a court filing this week, Black’s attorney says he lacks the financial means to post the bond. The attorney also said Black lives in Cantonment “with his family and has resided in the area for his entire life,” and other grounds will argued orally. A hearing date on the motion has not yet been set. @Jason Ward, I agree with you, both substances will show up for weeks after a single dose and the “high” lung gone. Just because he had these substances in his system doesn’t mean he was under the influence at the time of the accident. I am glad to know that someone else out there is thinking and not simply reacting. Is there a prescription for his Xanax and THC! Didnt think so, pay the price for using illegal drugs and getting behind the wheel!! Does he think this innocent family could afford to lose 2 children in one night? You made your decision to drive that night…. The judge made his decision. Deal w/ it. So by your reasoning, someone could come up top you and your family, pull out a gun and shoot two of your family members right in front of you, and you would consider them innocent…. Joran Jr needs to be held in confinement, pending trial. Look at what he has accomplished so far; who know what he is capable of next? Why take a chance? I would certainly no that on my record as a senior officer of the court, then there is the public to think of. @ Christopher. He can sit in jail until he gets chance to prove his innocence. Or maybe instead of arresting anyone give them a notice to appear no matter what they did. Rapers ,murders ,robbers and dope dealers see you in court in 6 months. Sure would free up space in the jails. We do have something in common my friend. Because I felt stupid just writing that. What is the difference between this guy breaking the law and someone who is Not under the influence and kills someone? This guy, if proven guilty will go to prison and so should anyone deliberately breaking the law. (Texting, speeding, passing on double lines, careless driving,etc) The difference! Anyone under the influence of drugs or alcohol can no longer make reasonable decisions. People who are sober and break the law should be just as accountable as this guy, because they are making decisions deliberately. Do the crime, do the time. If those were my kids, I’d bond him out myself, cause I’d have some unfinished business to tend to. I don’t like him but still I will a wait the verdict. No one has the right to cast judgement. Unless you’re a judge. Put him in a room for 1 hour with the family and friends of the kids he killed, If he makes it out alive then lower his bond. @Chustopher…you are very right…however he judged the victems..and killed them ..he proved them that way…the deceased didn’t get a trial…did you go to MIT…Mikes Instant Tuneup. For your worldly wisdom. He killed 2 kids, should hang immediately. Well, I’m sure the family of the 2 kids he killed wants them back too. We dont always get what we want!! Face the consequences of your actions.. He already had his chance, to prove he could live in our society, when he was on probation. the problem with narcissists, they don’t think of the people they harm as equal or even having self worth. They lack empathy for others and many times fail to recognize that people other that themselves have feelings. He should never be allowed to see the light of a day as a free man. He is innocent until proven guilty in the court of law. Wow!!! Asking for a lower bond is so inconsiderate, he should be sober enough now to have thought of what has occurred and would think twice about asking for bond. Should be hurting for what he have done to this family. Shouldn’t even be offered a bond. And if the family get him out they should also help him pay restitution to the family. He should be made to look at the pictures of the victims and then pictures of the accident and then pictures of the bodies at the funeral or morgue, three times a day just before each meal. Since the family cant have family meals with them anymore, he should be made to fill in the gap and eat with them sitting in front of him everyday for the rest of his life. I’m pretty sure every person who gets arrested can’t really afford it… he shouldn’t be any different from anyone else! His family can’t afford to get him out and my family can’t afford for him to be out. If his bond was $1 and you get him out he should get high and run you over. Mommy baby is cold and needs his blanky wanky. I pray the judges and juries sitting at that trail..envision tgat this was their loved ones..let him out..and he just might accomplish that. Let the right to live over ride what this excuse of a person is. If his bond is lowered he will leave the State and head to Mexico this is a ploy by the family to get him out so he can flee. Just my opinion. Bless your heart! I know two young people who will never see the light of day again. You had money for drugs. Instead of whining about getting out, use the time to think about what you did. Everytime I pass the scene of the accident, I think about what was done. Grow up!! I’ve resided in davisville my whole life “with my family” and can not afford everything I want, can I get a lottery winning and a new car since davisville is known for having so many winning tickets? Play stupid games win stupid prizes! Why should it be a families responsibility to be able to afford that. No amount of money will bring those kids back, no amount of money should allow him to get out. Stay there until trial and then once he’s found guilty, he can stay even longer! Should have thought about the consequences before driving while on pills or dope. Black wants a lower bond? What a joke. I hope this guy never gets out of prison. He has the nerve to ask for a lower bond…how dare you …you killed two people..a MOTHER had to bury two of her children…not only that you beat up your step dad and was on probation for that when you did this…sit in there and rot and shut up..
Woe is me…..what about the lives lost? They had family too! They lived here too! What about their financial distress? They had to bury two innocent loved ones. Maybe he should have thought about drugging up before driving. May he stay imprisoned and I hope it is an eye opener for him and anyone who thinks it’s ok to drink and drug before or while operating a vehicle! This is ridiculous! !